Like Charlie Hebdo, President Obama delights in picking at scabs to remind the world of its darkest flaws, but he simply can’t recognize his own. As a result, his godless and vindictive remedies offer no cure. They only cause greater infections. In the aftermath of the terror attacks in Paris, the White House taught the free world a surprisingly acerbic lesson. Like Charlie, President Obama and his brand of lampoon can be vile. The White House’s brazen absence from France’s unity rally highlighted the sardonic enigma Obama poses to the world. 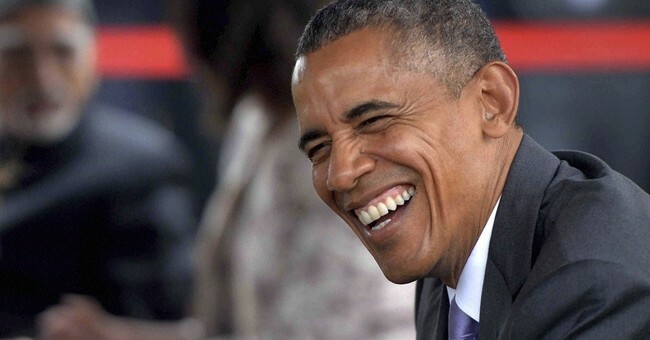 For America’s allies, Obama’s actions and words must feel a lot like satire. The president’s provocative irony and double meanings have long pervaded his esoteric plot. Israel later exposed more clearly what Obama might have been trying to say: Iran has new intercontinental missile silos and a new ballistic missile. A nuclear explosion would certainly heat things up: if Iran acquires a nuclear weapon, the world’s climate will change. That could be why Obama added, "the Pentagon says that climate change poses immediate risks to our national security." But the president usually explains such nuances later -- like after Iran goes nuclear. In fact, climate change sounds like Obama’s new euphemism for terrorism. It would not be the first word he has redefined. America and ally are two other examples while Islam and Islamic remain works in progress. Obama famously refuses to associate terror with Islam. He publicly scoffs at the idea that ISIS is Islamic, yet meanwhile, his administration insists that terrorists at Guantanamo Bay be treated like (legitimate) Muslims. Everyone knows that the inmates are provided Korans, prayer rugs, and an Islamic diet. The prisoners even have been given exercise equipment made in the Islamic world because they refused to use anything made by "infidels." Ironically, the Muslim world voices no objection to Obama gratifying the murderers he accuses of perverting the religion of peace. What ordinarily would look like insulting sarcasm isn't what it appears. Instead, treating savage killers as if they were (legitimate) Muslims is how Obama apparently shows respect to Islam and its prophet. This concept merely goes over the head of the average American -- a common hazard with satire. As a result of our own ignorance, Obama’s rebuff of the unity rally in France initially appeared to be an intentional dis towards America’s allies and a symbolic bow to the Islamic world. In reality, however, not sending anyone to represent America was merely the simple mistake that any leader in the free world could have made -- except all the other leaders of the free world were present and accounted for. On top of that misunderstanding, who would ever suspect that sending folk singer James Taylor to pacify the people of France with a mawkish song about friendship might be interpreted as a symbolic exclamation mark to a nasty snub? We all know how seriously Obama takes his responsibilities. Trying to make sense of Obama’s satirical presidency is no laughing matter. The president’s radical vision of the world seems completely absurd, but not taking him seriously has proved to be an embarrassing -- and dangerous -- global mistake. Lee Culpepper is a recovering high school English teacher and former Marine officer. Email Lee Culpepper or tweet him @drcoolpepper.